Chhattisgarh: Standing on a wrong foot has got a young IAS officer in a social media soup recently. 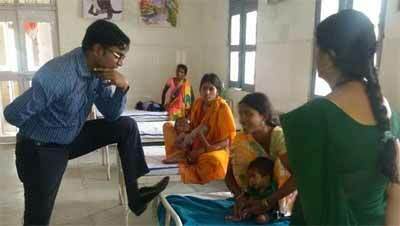 While on a round in a state hospital, Dr Jagdish Sonkar, the 2013-batch IAS officer was caught in a picture standing in a wrong pose. His picture went viral for all wrong reasons, since it captured him using his left foot for resting on one side of the bed. His foot was on the steel rail of the hospital bed. This happened during his interaction with a sick child’s mother lying on the hospital bed during a routine round of inspection in the hospital. The doctor holds a medical degree, and was interacting with different mothers getting their malnourished children’s treatment at the hospital. He is the sub-divisional magistrate of Ramanujganj in Balrampur district. Sonkar told Hindustan Times that he went to the hospital with a good intention and examined some patients as well. “My action was unintentional and avoidable,” he said. This incident further led to a social media uproar inviting huge criticism for the disrespect he showed to people. His uncivil manners earned him a social disrepute instantly. Infact, he was called the “India’s Arrogant Service” by the so many social media commentators or the netizens. State Chief Minister Raman Sigh when informed about his action and unwanted gesture, has promised action against him. His action will include instruction against the chief secretary to teach him more manners. The Minister implied in his statement that the secretary needs to learn the basic code of conduct for IAS/IPS. All the civil service officers should follow the protocols in the right earnest.